I seem to be going through a dip, sauce and spread phase. The one in my last post kicked it off I think. The “Sweet Red Pepper Hummus” I just enjoyed with my salad-y dinner. I accidentally lashed an overpowering amount of black pepper powder in it at the end…I ate some of the hummus that I had to fish out because of the pepper and my eyes are still watering! Got my circulation going at least 🙂 So I would just stick to using your sense both taste and common and not looking away as you pour said peppery pepper. 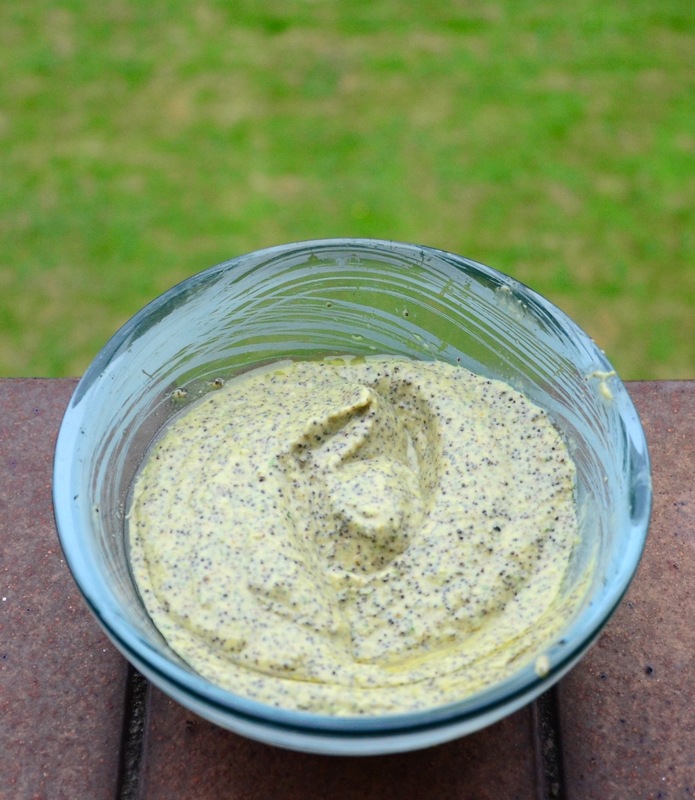 The “Wasabi Poppy Seed Dressing” is made extra yummy by some cooked shiitake. It almost tastes mustard like with the hot wasabi and brown rice vinegar. It was lovely with the aduki chicory salad that night. But first….. Roughly chop your pepper and garlic. Throw everything into your blender/ food processor and blend. Or use a hand blender in a bowl- you may need a little more water. If using a can of organic chickpeas with no added ingredients in it you can use some of the water from the can- as it has a chickpea flavour. That is it super simple sweet and spicy red pepper hummus. 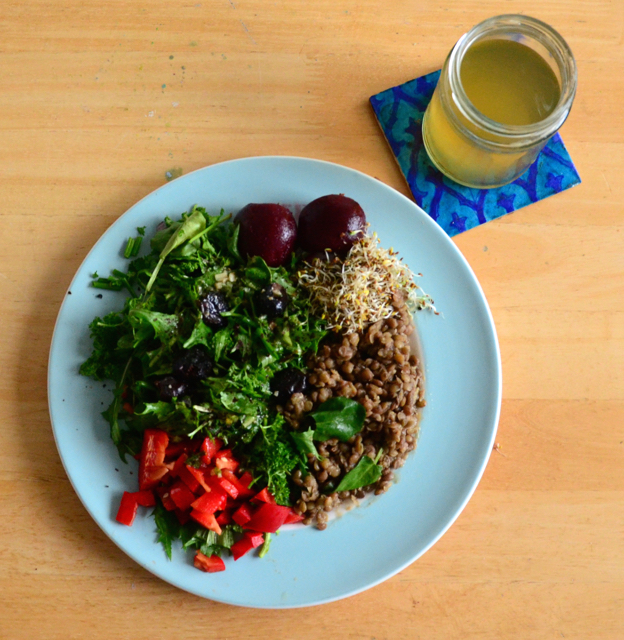 Adding naturally colourful foods where you can = bonus nutrients and antioxidants! 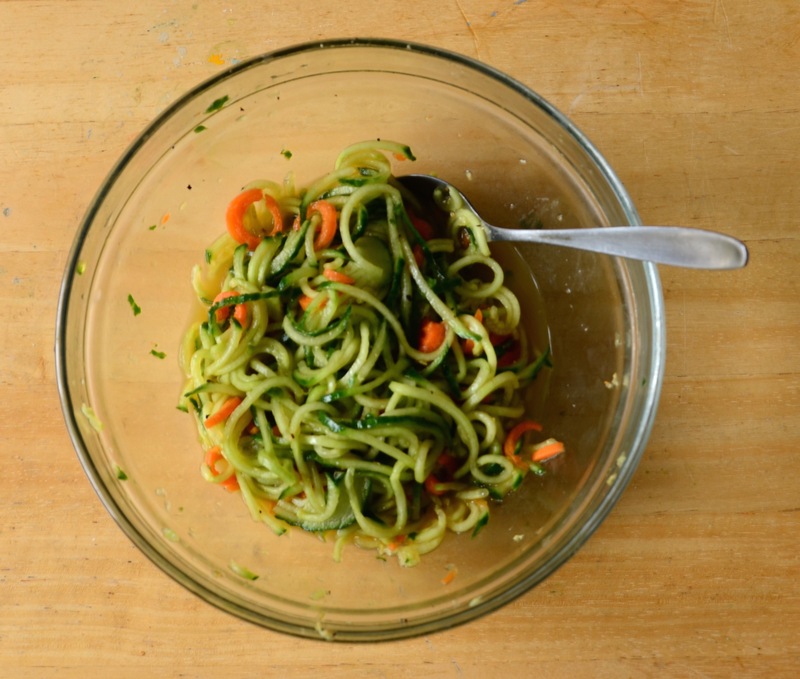 Serve in a pretty bowl with a sprig of parsley! 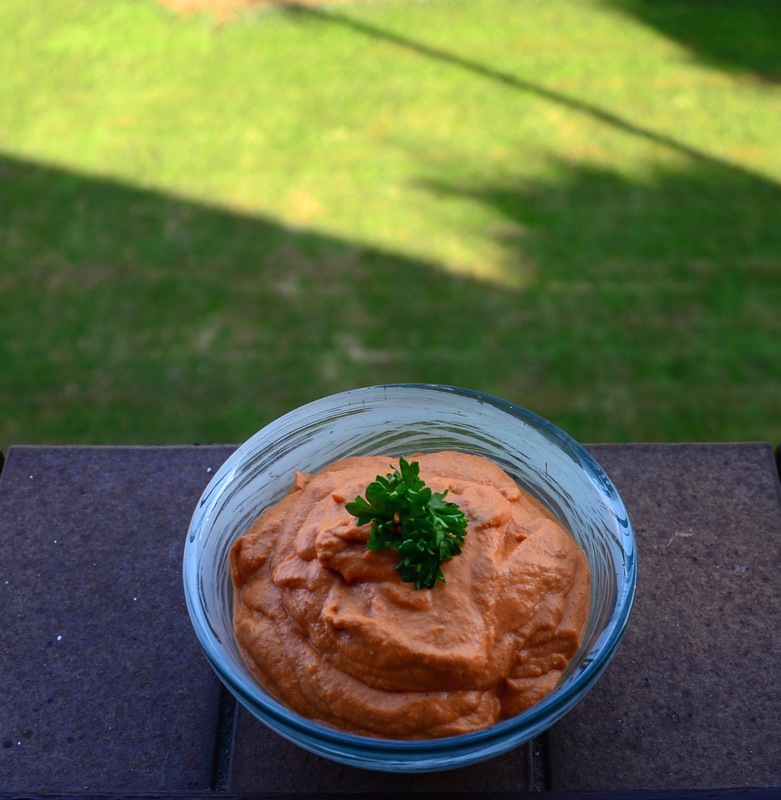 The red pepper hummus seems to have brought the sun out…perhaps just a coincidence! 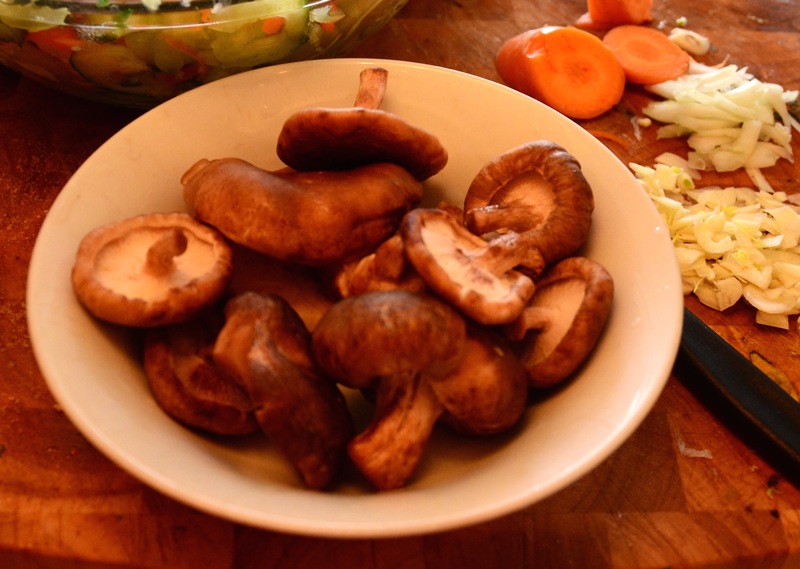 So wash your shiitake and slice. Put a pan/ wok on a medium high heat. Melt the coconut oil and leave for a minute. Put in your nigella seeds and let them sizzle. Add in your pepper and chopped garlic. After leaving the garlic cook and soften add in your shiitake. Reduce the heat to medium. Keep an eye, give them the odd stir. The mushies will be done when they have shrunk and are nice and shiny. Take off the heat and let the mix cool. 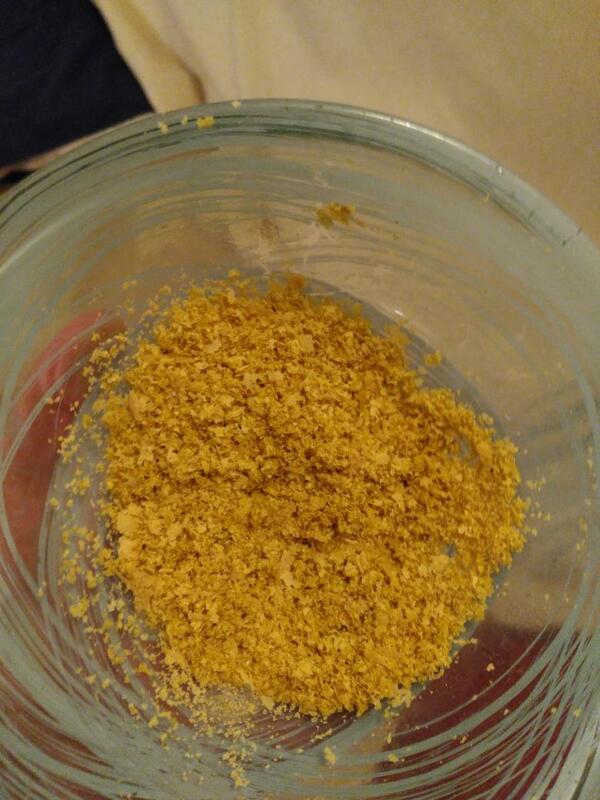 Put all the “throw in the blender bits” in the blender and add in the “cooked” bits. Blend! I have a setting on my jug blender for dip type things. It basically blitzes for a few seconds on and off at the start and then blends at a high speed for 30 second. It should start to thicken and emulsify. I gave a couple of five seconds blitz-iseses at the end. 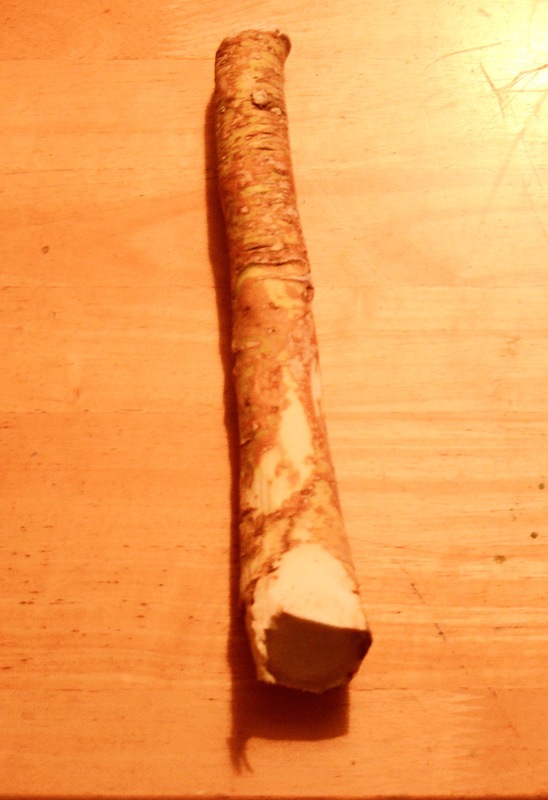 It was lovely with the aduki wilted wild chicory yoke I made. 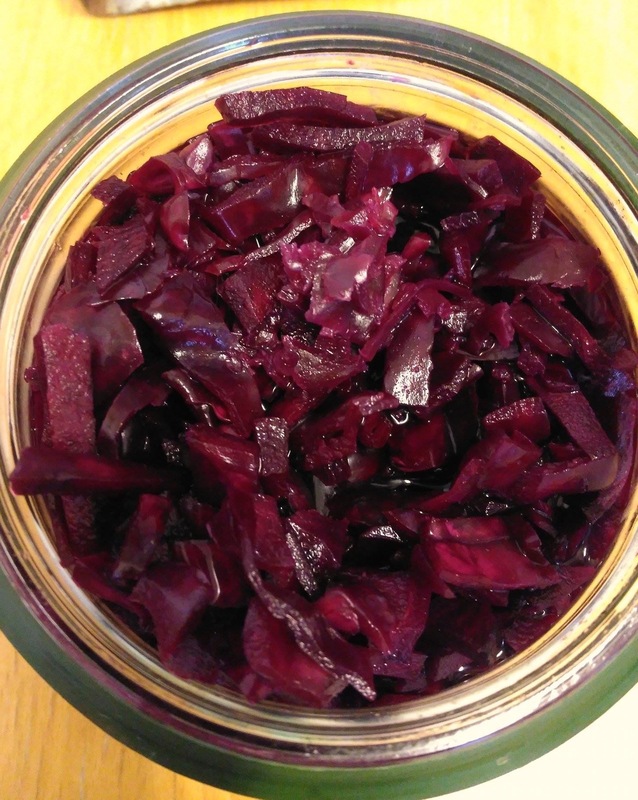 Also great on the spiralized side salad. Really mustard like! 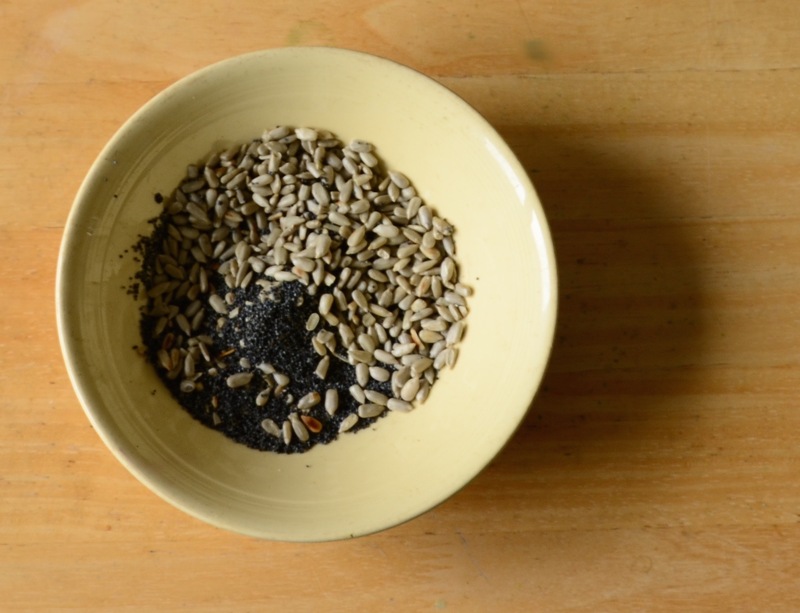 Got your dose of fermented food, and antioxidants with fabulous poppy seeds too! Incase you would like to see..here’s the salad. 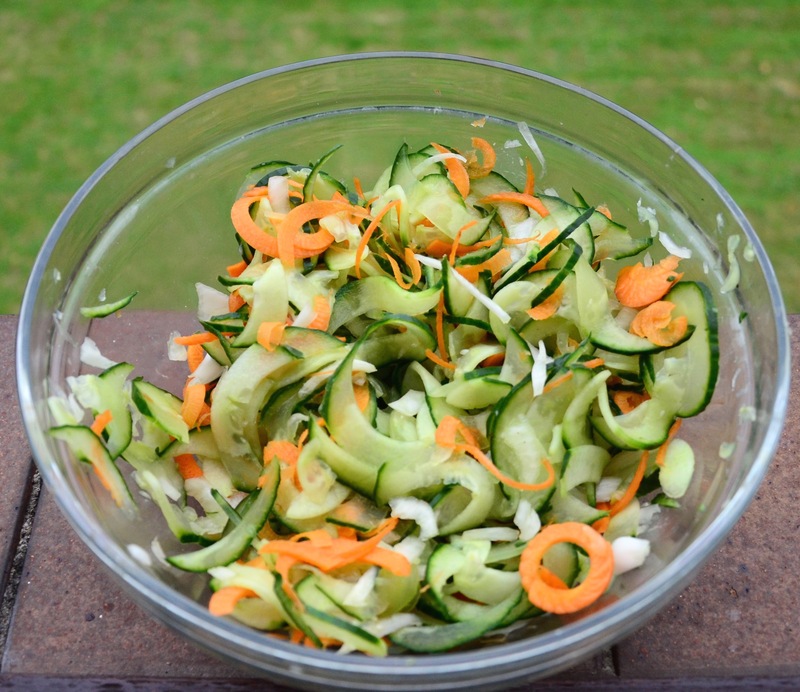 cucumber, carrot and onion and lemon juice…on my windowsill. Last week I was sick of all my dinners, I am always happy to have a big salad and veggies, but sauce wise I felt like I had been eating variations of the same thing for weeks! Though most of my vegan cookbooks lean towards the sweet I have a precious few that vary. I was gifted a fab book called “Fresh” from the Canadian veggie restaurants of the same name. The wonderful Denise gave it too me, she also improved my life by sharing her water kefir babies when mine died in a tragic accident. 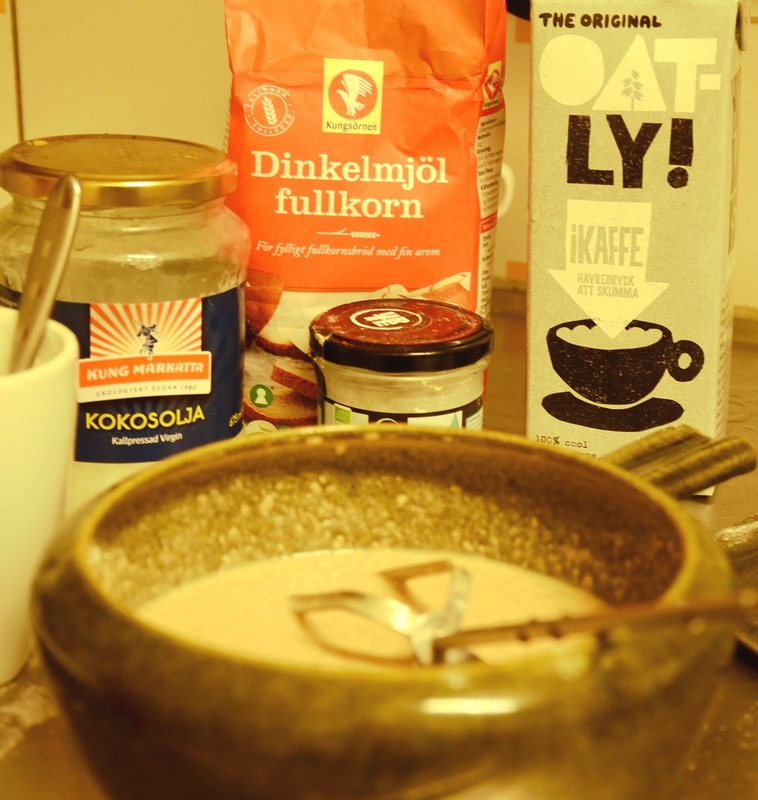 The recipe here is a blend inspired by two of the recipes. 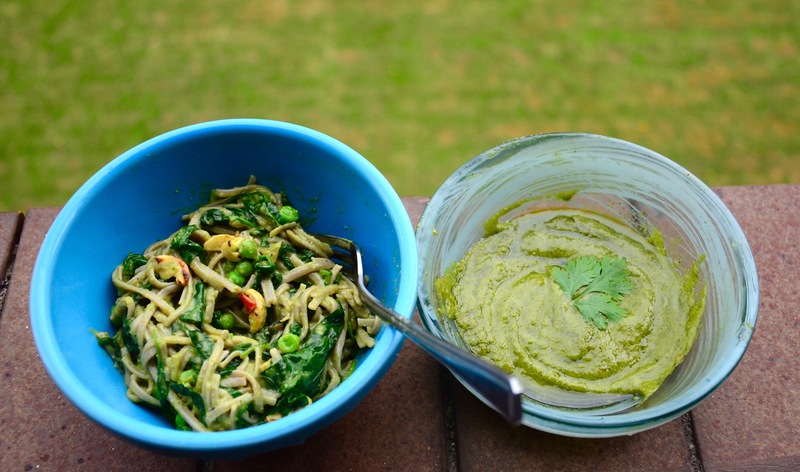 One is their “Tiger Noodles” and the other is their “Peanut Lime Dressing”. So here is my..
***do not do the whole can of coconut milk in the fridge thing, you want it soft. I had a curry tonight with the rest of the coconut milk. 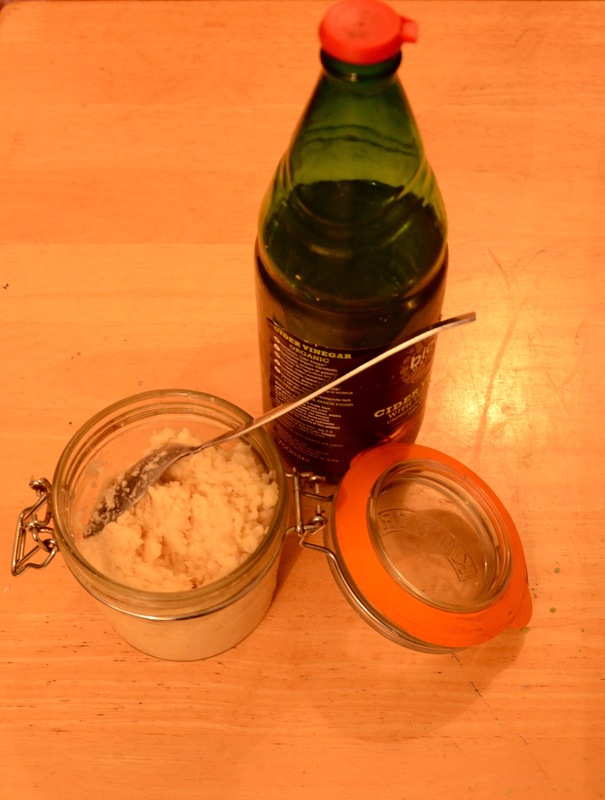 you can do the hard creamed coconut just soften it with a little warm water. Get a wok on a medium high heat and add your coconut oil. Let it melt and heat for a minute. Add in your nigella seeds and black pepper and let them sizzle. Add in your onions, salt, ginger and turmeric. Cook until onions are softening add in your coconut sugar. Keep stirring until sugar melts and everything is coated. Add in your garlic. When onions are transparent add in your chopped coriander/cilantro. Set these aside to cool. Once cooled bung in your blender/ food processor. Now boil a kettle and get water on for your noodles. Using the same ring but a different pot, obviously! Let the dry pan warm for a minute. Toast your cashews until they just start to turn golden- don’t stray they burn easily… I speak from the experience as someone with no attention span. Set to one side. Put your noodles on to cook. Mine only take 5-6 minutes. Put all the ingredients for your dressing in the blender- put the sunflower oil in too. BUT NOT THE OLIVE OIL. Start blending and drizzle in the olive oil as it blends. If you can’t pour into your blender/ food processor then just put it in at the start. Blend and watch it turn a beautiful vibrant green! Put your wok that you cooked your ingredients in earlier back on a medium heat. 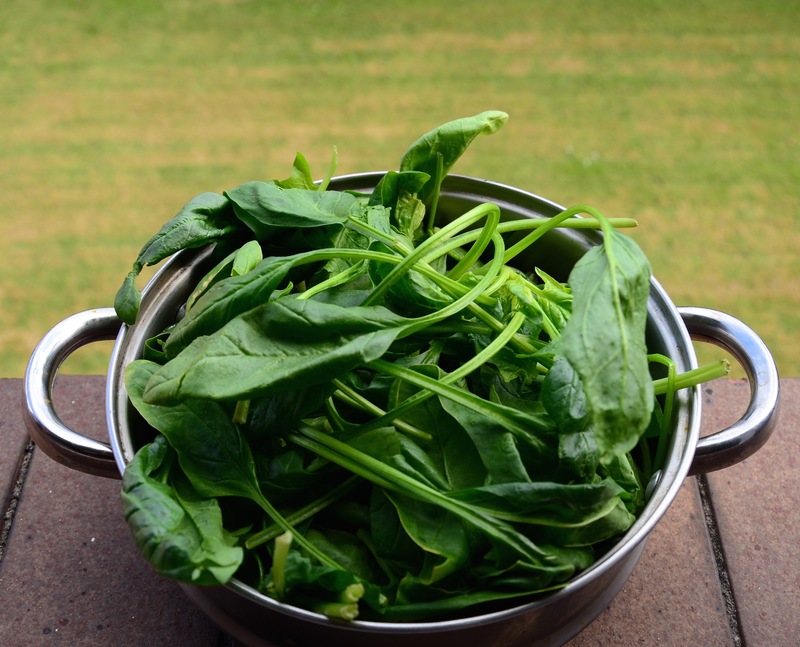 Rinse your fresh baby spinach and the peas ( to get the ice off). And throw into the wok to cook and wilt. Throw your cooked noodles into the spinach and peas and fry for a few minutes. 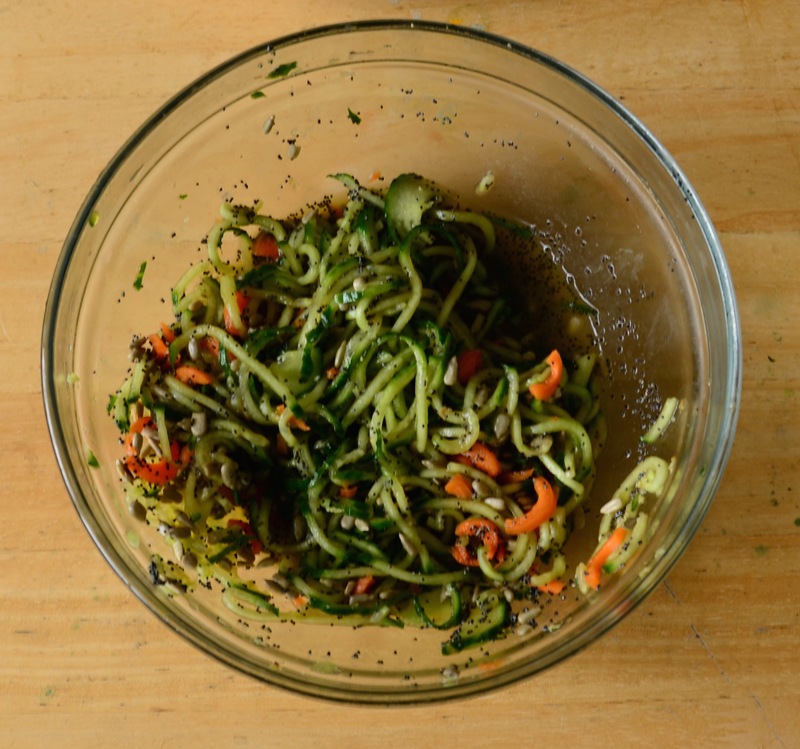 Take off the heat, add your cashews and pour half of your scrumm-y yummy vibrant green dressing over the noodles and stir through. Check for seasoning- add more black pepper or salt if needed. 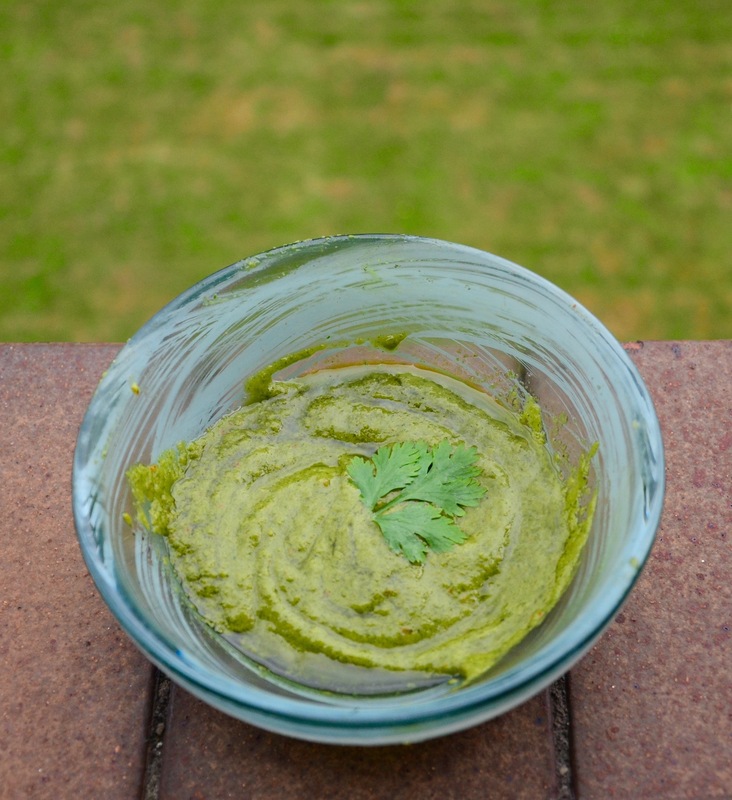 Serve with a sprinkle of coriander/cilantro and with more of the dressing on the side! Tasty, green and healthy.. and not another tomato sauce!! 🙂 Hope you try it out!! Here is evidence of what a tidy cook I am…. 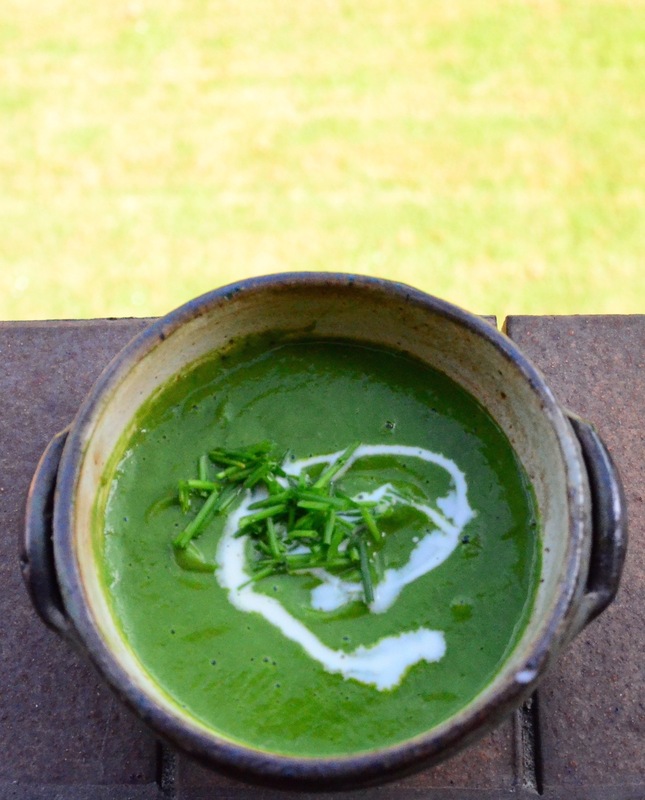 This is the brightest greenest soup I have ever made, I just feel healthier in the glow of it! It only took 45 minutes from start to finish including taking photos! Nettles come in to season in spring and that season lasts until the end of May. They become to old tough and stingy after that! That said they still sting a bit- so handle with care! Traditionally they would be picked in the countryside or out of your own garden. It is the shocking reality of city life that I bought mine, but I am grateful that the McNally organic farm stall realised that urban dwellers would also like nettles! My Dad grew up having this iron and silica rich food in his diet, but my first attempt at cooking them went terribly wrong. I simply over cooked them and the soup became incredibly sour. 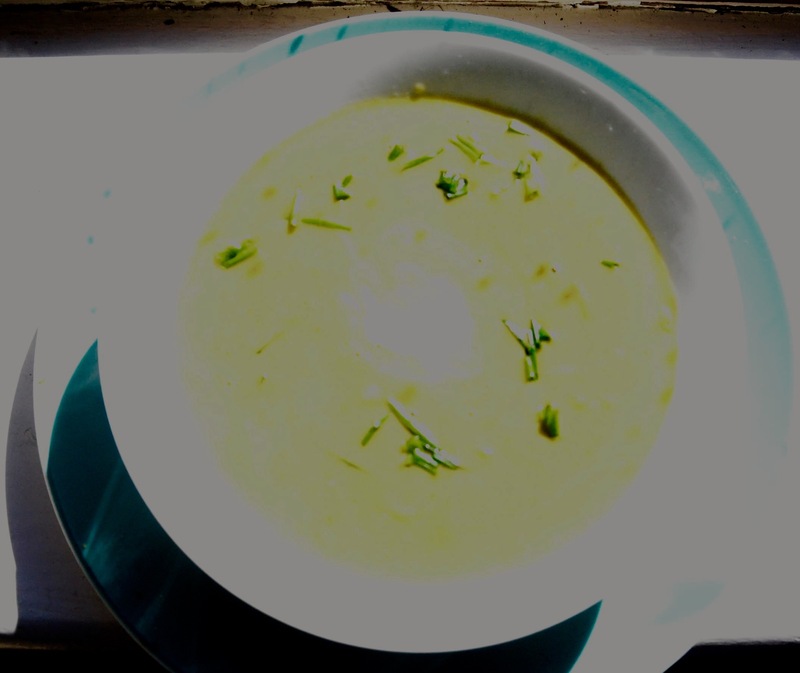 If cooked for only a minute or so they lend the soup a lovely lemon fruity and green flavour. Mostly nettle soup would be made with a base of potato, I am not a fan of the starchy spud and I already have enough tomatoes in my diet to cover my nightshade consumption quota! I used a base of organic cauliflower and carrots, my extra seasonal goodies I have young spinach, rainbow chard, chives and wet garlic! 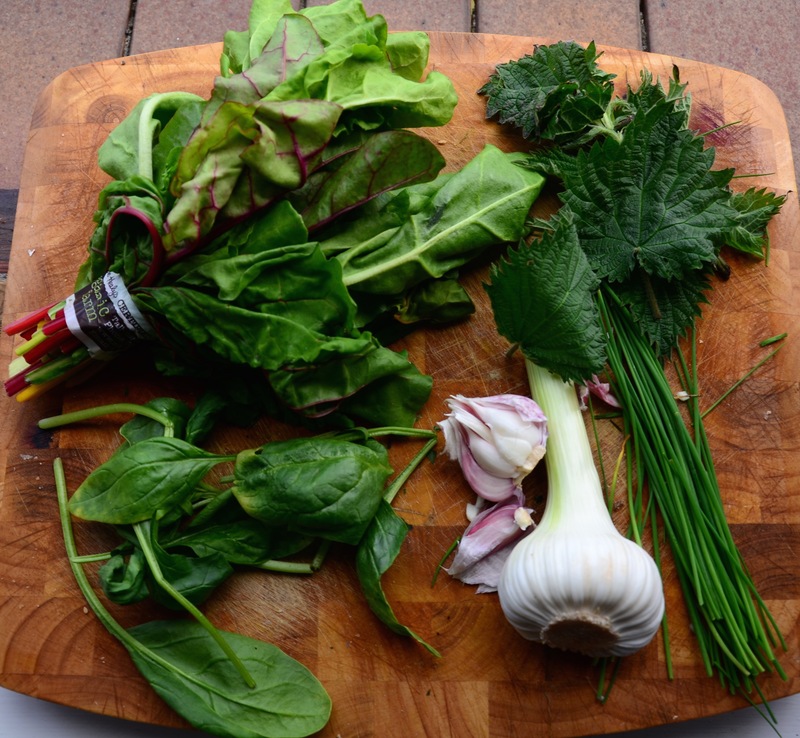 If you cannot get your hands on nettles try some rocket, Persian cress or mustard greens! Optional: A few dessertspoons of cashews or a ripe avocado instead of the vegan cream! **I used half an organic onion stock cube to two cups of boiling water, cubes are of course hydrolysed veg protein free! Start by melting your coconut oil in a deep saucepan on a medium heat. Add your mustard and nigella seeds and let sizzle for a minute. Add in your (onion if using) wet garlic and some black pepper. Let cook for another minute or two, don’t leave the garlic burn or it will be bitter. Add in your chopped carrots and cauliflower. Pour in your stock. Add your bay leaves and turmeric. Let these simmer and cook for about seven minute, just until the cauliflower is cooked. Meanwhile while you wash your spinach – very well. Throw in your chives and washed spinach. Give it a few stirs, leaving the spinach wilt. Next is the hide and seek game with the bay leaves! Try and find them and take them out before you get to blending. Take the mixture off the heat and then get to blending! A hand blender should be fine. I used a jug one, be careful ladling the mixture into your blender, it will be piping hot! 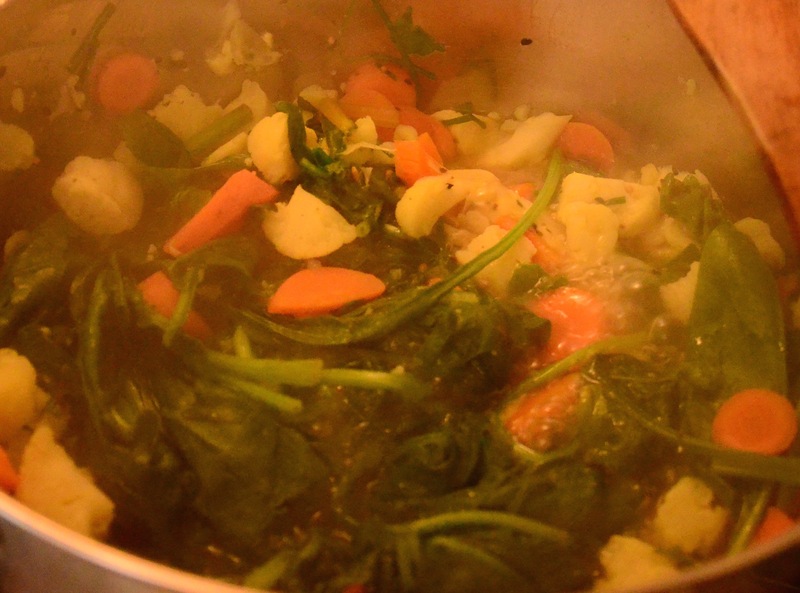 If using a jug blender pour the soup back into the saucepan and back onto a medium heat. Add your half a cup of hot water to thin out the soup a little. Add your mirin. Taste to check for seasoning. 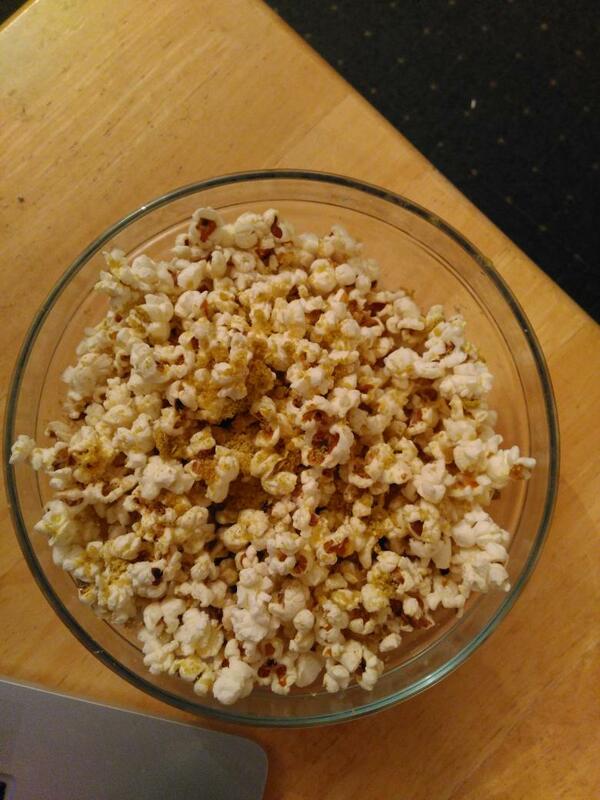 I added more black pepper, but it didn’t need any salt. 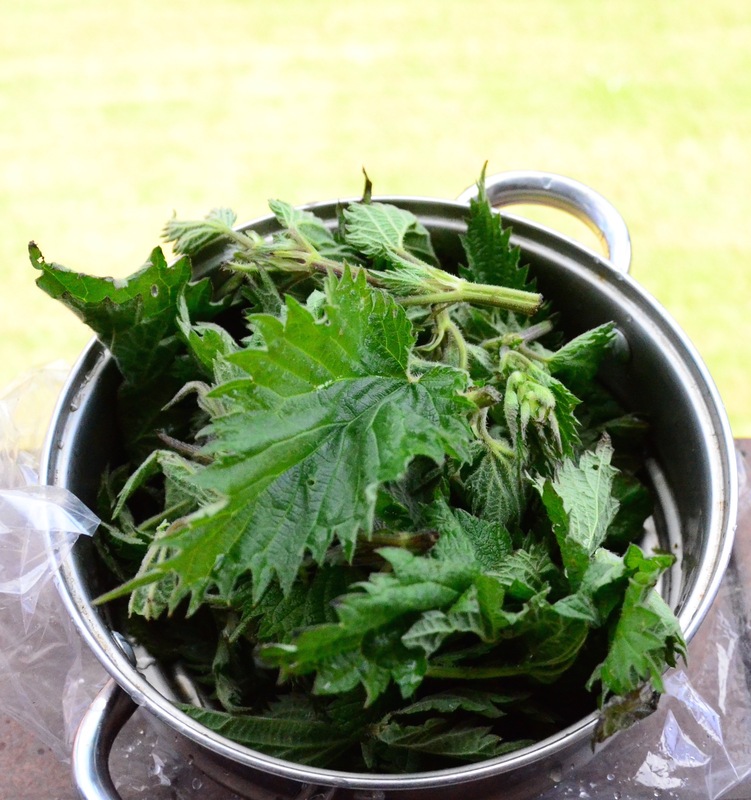 Wash your nettles, take your time, wash them well to avoid gritty bits later! 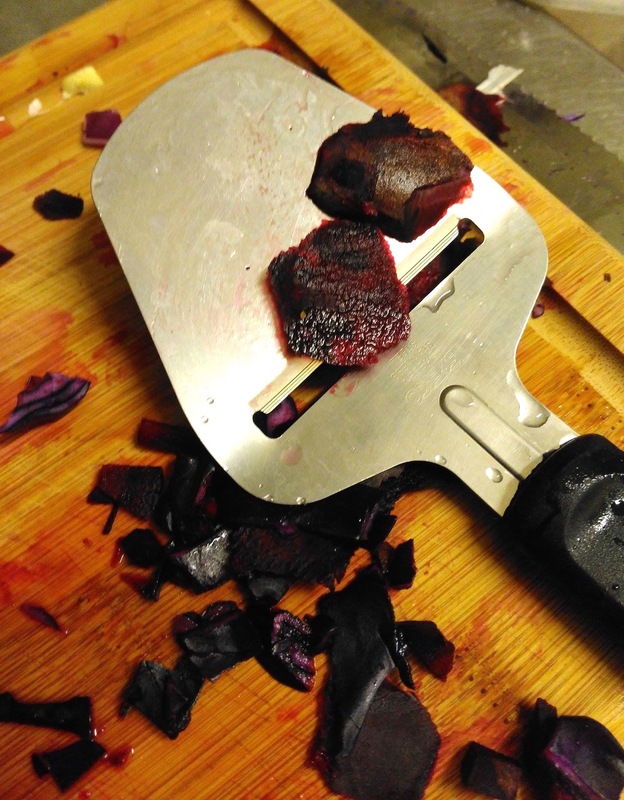 Usually people chop off the tough ends of the stalks, if you are using a hand immersion blender you may want to do this. You would probably be best advised to use gloves, or be careful not to tip of the stinging leaf edges. I didn’t bother removing the stalk ends, I just threw them into the colander and rinsed them in the sink. Pop them into the saucepan, stir them through so that the are covered by the soup. The leaves will begin to wilt quite quickly. Remember you are only cooking them for a minute or so. You are going to blend it all anyway so any tough stalks don’t matter. Again with the blending! If using a jug blender and you decide to go for cashews or avocado blend them first with a ladle of the soup. If using an immersion blender use the avocado and just chop it and throw into the soup before blending. Alternatively whiz up your soup just until the nettles are blended and then add in your 100ml of vegan puoring cream of choice and blitz again just to mix it through. 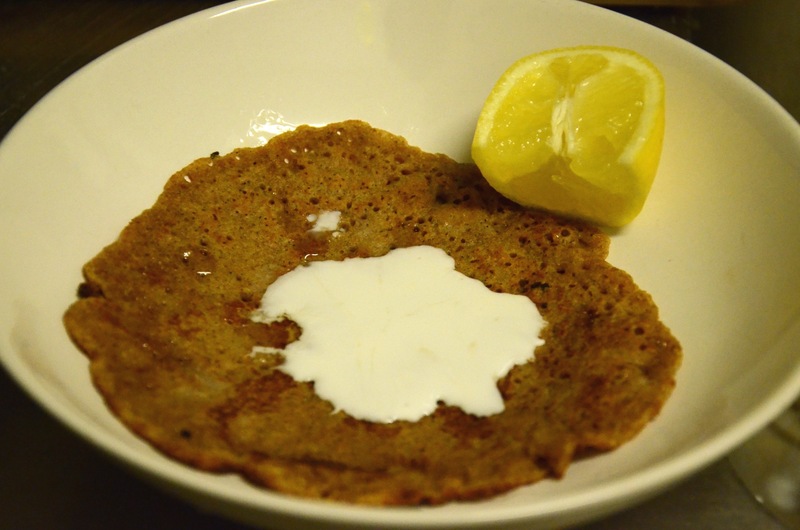 Seasonal Iron Rich Vegan Dinner- gluten free too! So I love my green foods, have them until they come out my ears! Lately though I have found myself having less dark leafy salads because of the cold weather and less seaweed as I have it in my salad! Veggie people are no more likely to suffer from an iron deficiency than meat eaters but is something we should all not be lackadaisical about. Seasonal Iron Rich Vegan Dinner for two! Roughly 4 cups of Purple Sprouting Broccoli it doesn’t fit in a cup! A squeeze/ teaspoon of fresh lemon juice. A sheet of nori seaweed- to use like a wrap! Grab your broccoli and cut off a tiny bit of the tough stem. Leave the leaves, they all part of the goodness! Give them a rinse and pop them on to steam for roughly eight to ten minutes. 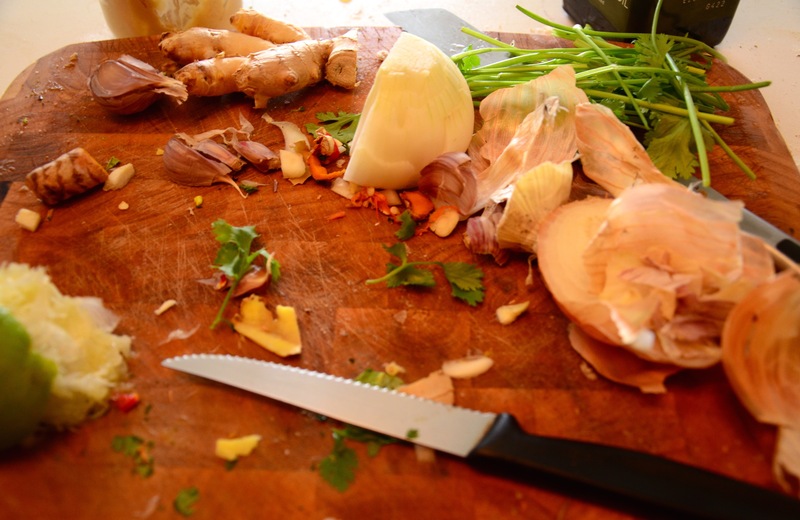 Chop your onion and garlic including the garlic for your salad dressing. 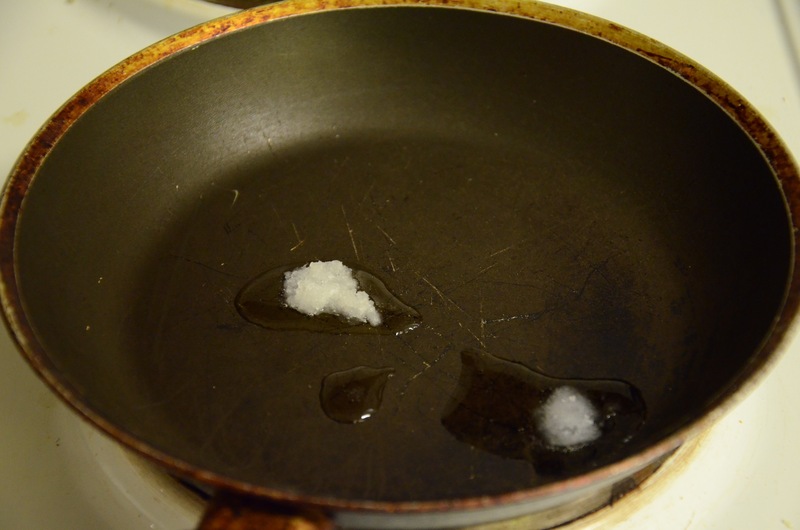 Melt your coconut oil in a wok or pan on a medium high heat. Once it is heated a bit throw in your nigella seeds, chilli flakes, and a bit of black pepper. Now add almost all your onion (you are keeping a bit to put in your salad later).Add your sea salt. Leave cook for a few minutes- the onion will go transparent pretty fast. Add in the garlic- let this cook. Next throw in your pinto beans (also a good source of iron). While the pinto beans heat through rinse and chop your herbs. Put about half in with the pinto beans and keep half for the salad and salad dressing. Turn the heat down to medium. Add the dillisk/dulse and basil if using. Your purple sprouting broccoli should be ready at this stage. Add this to the pinto beans. Mix everything together and add in your extra virgin olive oil. Taste and see if it needs more seasoning. Remember you will be having it with the salad dressing so be cautious with the salt. I now turn the heat off but leave it on the ring. Prepare your salad dressing. I make a little jar full as it will of course keep. It is even better the next day as the garlic infuses into the oil and the miso starts working on everything! Having right now on tonights dinner! 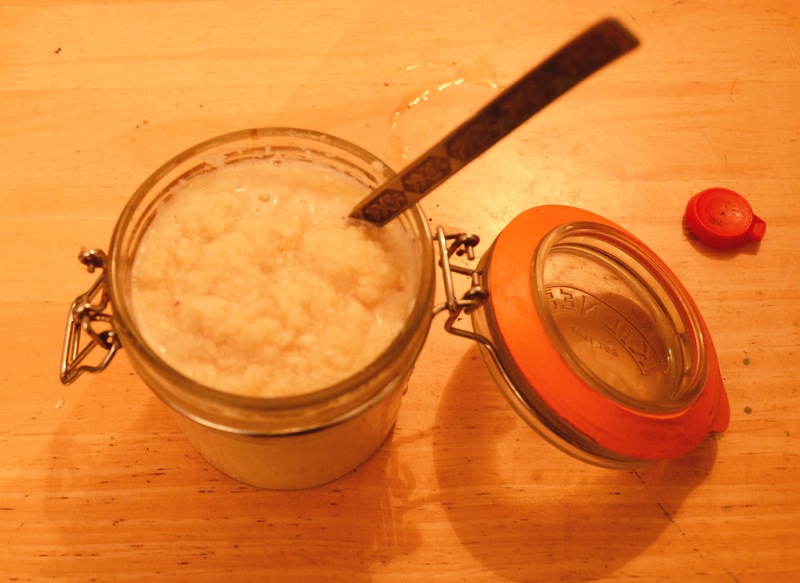 Put your garlic, herbs, miso and black pepper in a jar- that you have a lid for (you want to be able to shake it!). Add your oil. Now add your mirin, apple cyder vinegar and lemon juice. Put the lid on and give it a good shake. The vinegar and lemon juice help emulsify the dressing. 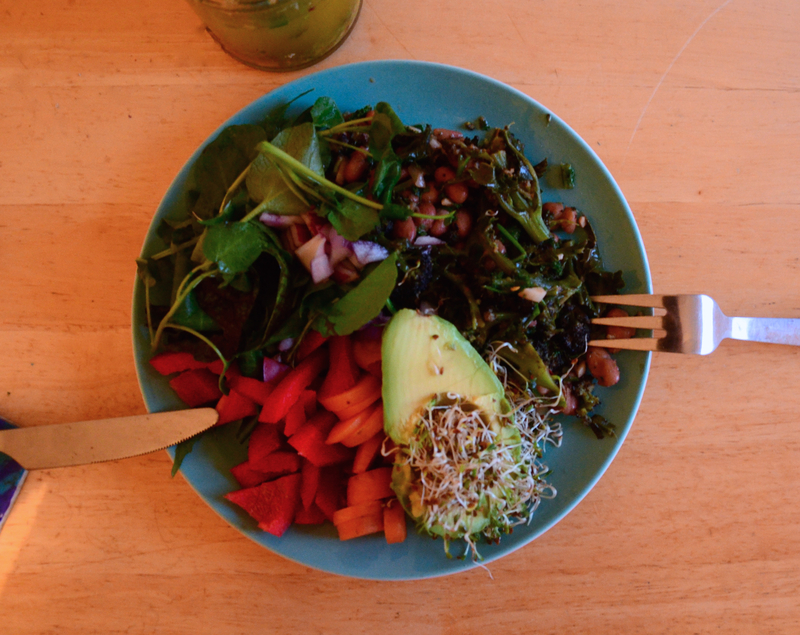 Throw all your washed dark leafy greens in a bowl. I like to tear mine rather than chop. Mix in your herbs. Chop your red pepper and carrot and either serve on the plate or add to the salad. I prefer to put the salad dressing on the table and let people take as much as they like. Chop your avocado in two and put alfalfa on it! 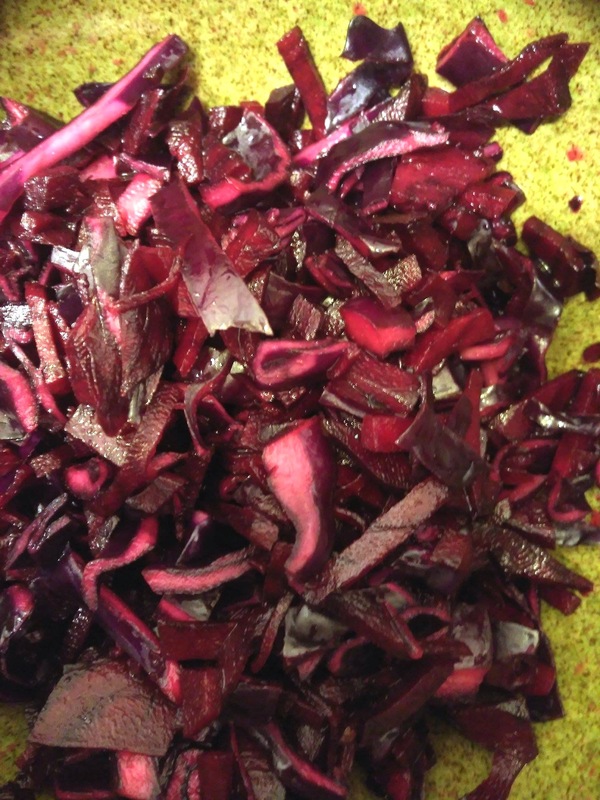 Go back to your purple sprouting broccoli dish and squeeze your lemon juice over it and give it a mix. I find the sharp fruity lemon juice really helps bring all the flavours together. P.s In tonight’s dinner I discovered that freshly cooked brown lentils are made even more addictive by the addition of half a teaspoon of ume plum puree!!! And that my water kefir looks like pee in this photo! 😉 Though not photogenic it is full of good bacteria, yeasts and enzymes that will help with my digestion.